Bluebell Gadsby was such a wonderful character. Right from the first pages of this book and she'd managed to worm her way into my heart. I wanted to give her a big hug and make her hot chocolate and tell her everything was going to be okay even when things patently aren't all right. Because at the beginning of After Iris, things really aren't all right. Blue has this really large, slightly dysfunctional and quirky family (and I love reading about large, weird families like the Gadsbys!) and sometimes Blue feels like she's the only one that still remembers Iris and who still grieves for her. Her other sisters and brother have moved on to rat fixations and drama productions at school and Blue's parents are never at home. They're either working and living in a distant city or travelling to faraway places leaving the Gadsby children in the care of an au pair. It's no wonder, really, that Blue turns to her diaries as a means of getting through this difficult time. Blue really has nobody to talk to, nobody really to pay her any attention or to listen to her or notice her. At least not until a new boy, Joss, arrives and with his arrival begins to shake things up in Blue's life. I loved how Joss was able to bridge the distance between Blue and the rest of the world. It's tricky being 13 even without such grief like Blue's to deal with and with emotionally and physically distant parents to boot. 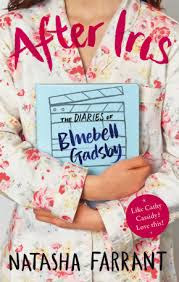 And Blue goes through a lot in this book: with her family and with friends and falling in love for the first time. And I loved going through these things alongside her. I loved how subtle and quietly powerful Blue's observations are of her life and the little ways in which her family is broken and of the baby steps they all take together to heal in some small way. After Iris was a really emotional read for me - one that made me smile and laugh, one that made my heart hurt and tears leak from my eyes. I can't wait to read more! Thanks Aa'Ishah :) It's a really wonderful book, I hope you love it as much as I did if you get around to it.. I wasn't too fussed about this until you started to decalre your love for it - now I'm really looking forward to it!